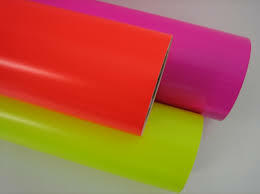 Our Intermediate Fluorescent Films are recommended for interior applications, but will provide short term durability based upon vertical exposure and application outdoors. These films provide high visibility in daylight conditions, but are particularly eye-catching at dawn, dusk or at times when visibility is poor. The FS colors are 3.5 mils thick and have a satin finish. The FC colors are 5.5 mils thick and glossy. The FS colors are yellow-FS03, Orange-FS04 and Red-FS05. The FC colors are Pink-FC01, Yellow-FC03, Orange-FC04, Red-FC05 and Green-FC06.